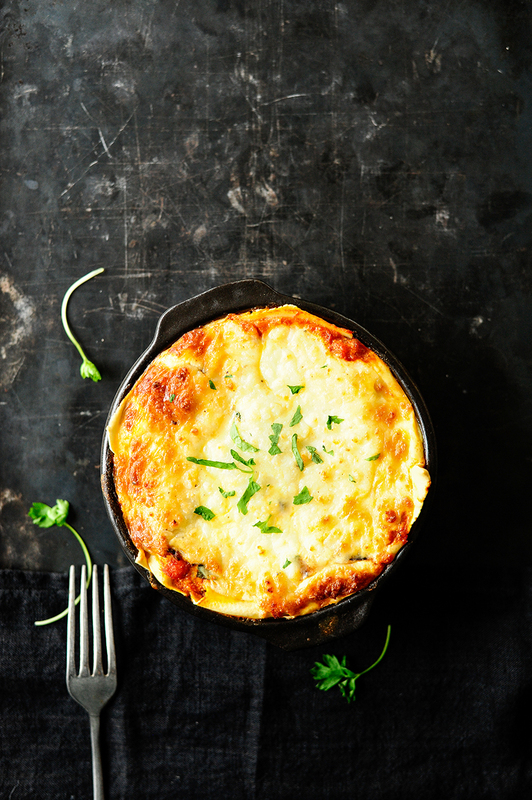 I just realized, i love lasagne:)This delicious lasagne with grilled eggplant is layered with a light tomato ricotta sauce and home made lasagne sheets that just melt in your mouth! Topped with the most creamy cheese sauce made with mozzarella and Parmesan. For anyone who loves cheesy pasta dishes, this is real comfort food! Boil some water in a large pan, place the tomatoes for 10 seconds in the boiling water and then rinse under cold water. Remove the skin, cut into quarters and remove the seeds. Chop into small pieces. Heat the oil in a saucepan and cook the onion and garlic. Add the tomatoes and simmer for 10 minutes. Add the tomato puree, parsley, oregano, paprika, salt and pepper. Simmer for 30 minutes over low heat. Put the flour, eggs, oil, water and salt in the bowl of your food processor and turn 5 minutes at medium speed. Remove the dough and knead by hand for 2 minutes. Cover and set aside. Cut the eggplant into long thin slices, sprinkle with salt and let stand for about 10 minutes. Drain, sprinkle with olive oil and grill on both sides on a hot grill pan until slightly softened. Divide the dough into 8 pieces. Take one of the pieces and flatten it out, brushing some flour on both sides. Roll out into a thin sheet or feed it through the pasta roller. Repeat with the remaining dough. Cut pasta in lasagne sheets and put into boiling water for 1 minute. Remove and immediately rinse under cold water. Add ricotta to the tomato sauce and season with salt and pepper. Grate the mozzarella and Parmesan and combine with egg and heavy cream. Season with salt and pepper. 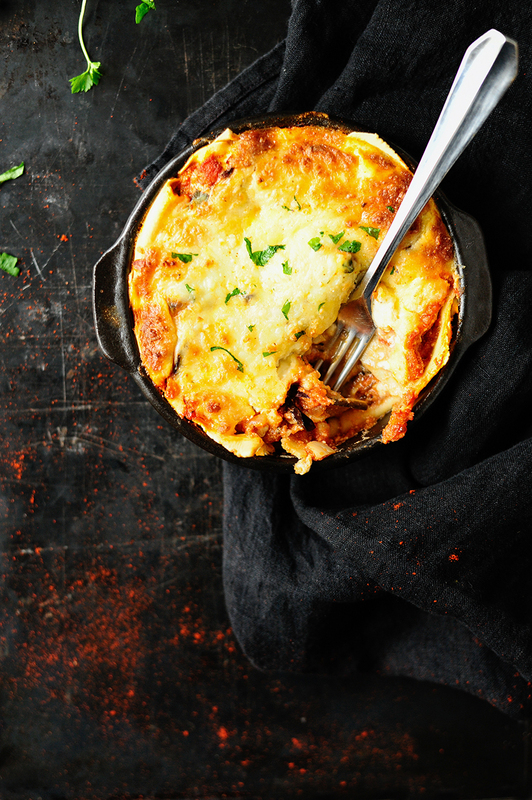 Grease your baking dish with oil, add a layer of lasagne sheets. Sprinkle about 1/3 tomato sauce and add 1/3 eggplant. 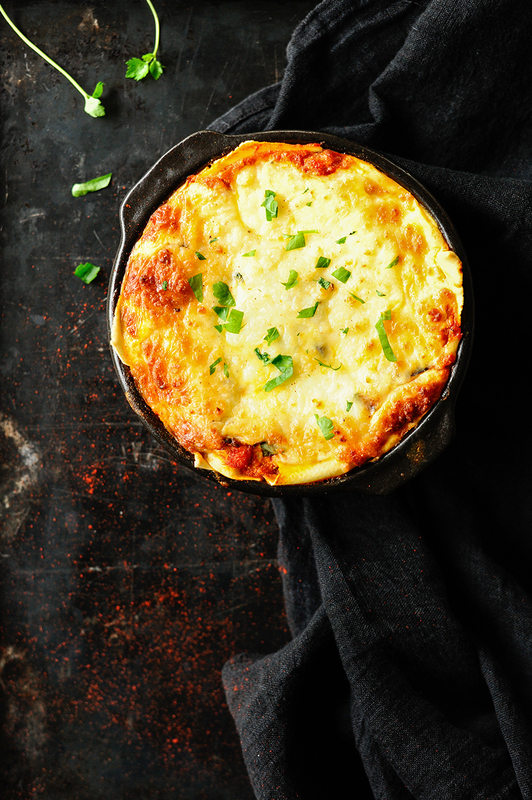 Repeat the layering process until you have about four layers and top with the creamy cheese sauce. Bake for about 30-40 minutes at 180°C. Let stand for about 10 minutes before serving. Enjoy! This looks heavenly. Between all the cheese and the perfectly rich eggplant, I don’t know if I’m going to be able to share! Definitely adding this to my to-do list! I have been making this multiple times now, that sause is heavenly! This is my “to go to” recipe when I have lots of aubergines at hand. Never tried to make pasta myself though, so I’ve used boxed lasagne sheets, but it worked. I am thrilled you loved this Elvira! Thank you so much!